This is my digital Art for this fortnight's Scripture Challenge with Patter Cross. My Bible verse comes from The Message which is a Bible I do not use much at all but I do like the way this is worded as it is so true. Then I did a google search on Christian Quotes using the word HOME and came up with this one by Augustine which is one I have never come across before but is such a good one. The digital kit I used for my art is called "Home" and is by Just Passin Thru and worked so well with my art for this challenge. I am on the Creative Team for Just Passin Thru - Nikki Chamberlain and it was so nice to be able to use one of Nikki's older kits for my art today. She is selling her designs exclusively now at Nuts 4 Digi. Okay, LOVE the cross stitch for this, and the Message version made me chuckle. Too funny but so true. Don't get comfortable here! He has something much better waiting for us in His mansion! Love this. Have a blessed day! 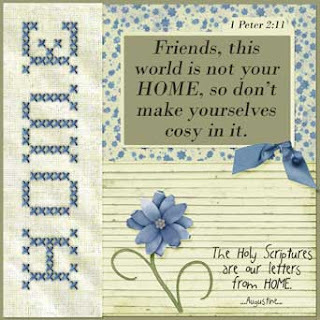 Oh so cute not much is more homy than cross stitch! Love the quote. I do love the wording of this scripture from the Message as well. Love your digital cross-stitched title. very well done. Really like your digital artwork! I didn't know that Augustian quote. TFS.